Miami Beach Movers – Few things in life are as difficult as moving. Discount South Florida Movers is here to help you with the process. Our mission is to take away the stress and hassles that come with even a small move. Drawing on our many years of expertise, we will set your mind at ease with our professionalism and attention to detail. We guarantee that you will be satisfied with our service and our rates. 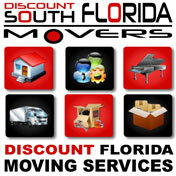 Here at Discount South Florida Movers we are experts in all aspects of the moving process. We can accommodate any special request from nighttime hours to moving specialty items like pianos or antiques. It doesn’t matter if you are moving across Florida or simply down the street. We will handle your move quickly and skillfully. Miami Beach is a resort city in Miami-Dade County. It is a series of islands, some natural and others man made. The city is separated from mainland Miami by the Biscayne Bay. This coastal city of 88,000 people is widely known for its many beach resorts. Its Art Deco Historic District is listed on the National Register of Historic Places. The city was first developed in the late 1800s to serve as a refuge for shipwrecked sailors. From there it assumed many roles from coconut plantation to port town. In the early 20th century, it was developed into a beach resort, which it remains to this day. It is also known as a destination for bicycling and one of the country’s first bike sharing programs was started there. Discount South Florida and Miami Beach movers provide low rates on residential, commercial, piano and long distance moving.